When you have picked your wedding colors and have decided on red as one of your colors, you need to find red bridesmaid dresses for your bridesmaids. Red is a vibrant and brilliant color choice. Red is often chosen for holiday or Valentine weddings. The color red can be used anytime of the year and is not just for weddings during holiday seasons. 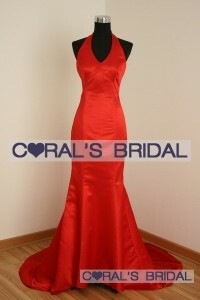 If you want a brilliant splash of color in your wedding, bridesmaid dresses in red will add that color. Whether you decide on a deep dark red, a bright brilliant red, or any shade in between, red dresses on your bridesmaids is sure to be a stunning background for you in your wedding dress. For a daring look there are one shoulder bridesmaid dresses in red. Flowers accent the shoulder strap and top of the dress. The chiffon material is soft and hangs nicely. The dress will swirl as your bridesmaids walk up the aisle ahead of you. This dress comes in floor length as well as a shorter, above the knee length. You can choose this dress for more formal evening weddings or less formal afternoon ceremonies. If your wedding is going to be a more formal affair, you can have your bridesmaids in this stunning red formal bridesmaid dress. Strapless, elegant, and the dress sparkles. Floor length with a shorter front, the dress will pool around your bridesmaids with the small train. The dress has sparkles added to the top with silver and red jewels down the front. If you want your bridesmaids to shine in red with a romantic and formal style, a ball gown dress in red may be your pick. 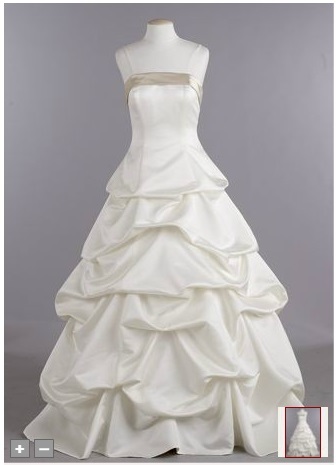 This strapless, full ball gown style dress will float around them as they walk up the aisle ahead of you. If your wedding dress has a full skirt, this dress will match that style. The dress has a bit of sparkle above the full skirt that allows easy dancing. For a more casual wedding or just for a fun look in a bridesmaid dress of red, you can go with a tea length dress. 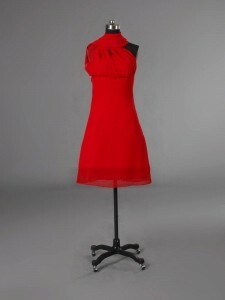 The red strapless dress has ribbon accents. It flows below the knee with an uneven cut to the hem. This dress has a fun and flirty look your bridesmaids will enjoy. 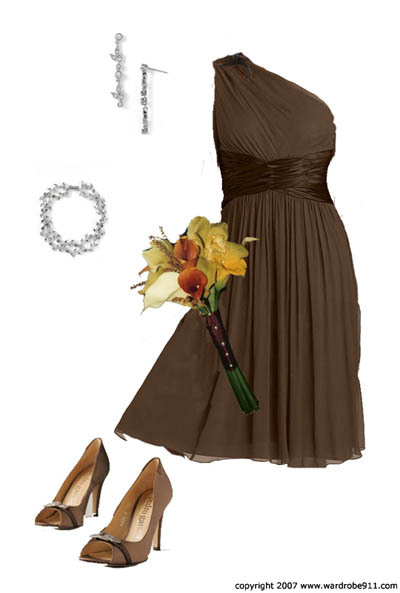 Another option for a more casual wedding is a simple tank top style dress. This bridesmaid dress in red is cut above the knee. The simple tank style dress has an attached scarf that is worn around the neck to give an elegant look to the dress. 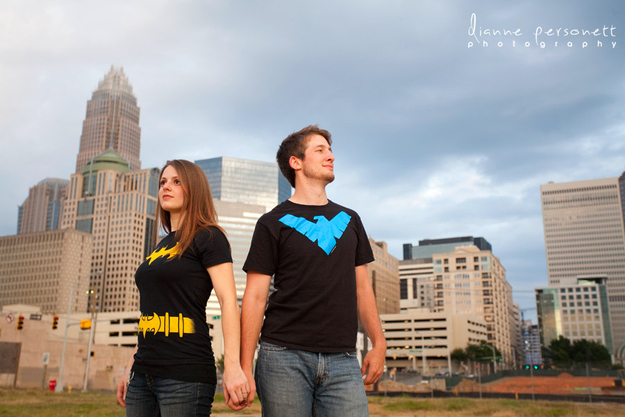 It is a unique choice that will look wonderful on your bridesmaids as they surround you for photos. A classic halter style dress in red will look stunning on all your bridesmaids. With a short train that flows on the floor the red satin dress will give the appearance of your bridesmaids gliding along. Your bridesmaids will shine in this classic dress. You will stand out brilliantly in your white dress next to the satin red dress. If your wedding is planned for winter, you may want to add long sleeves for your bridesmaids. A red velvet bridesmaid dress will keep them warm and at the same time, let them look stunningly beautiful. The gothic style dress has long sleeves that end over the fingers in an extra wide finish. The floor length dress is wonderful for evening or formal weddings. 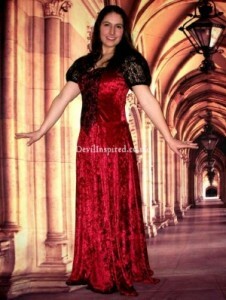 If you like the Victorian look, you can choose this red lace Victorian style dress for your bridesmaids. The dress has short black lace sleeves for contrast. There is also black trim along the flowing bottom of the floor length dress. If your wedding dress has a Victorian look, this dress will accent yours beautifully. Bridesmaid dresses can be simple styles and still look beautiful for your wedding. A chiffon dress in red with three quarter length sleeves will look wonderful on any bridesmaid. The v-neck dress has an empire waistline and falls gracefully just below the knee. The simple style will look stylish on your bridesmaids. 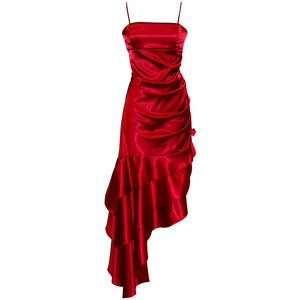 For a fun and glamorous look, you can choose a red dress for your bridesmaids with ruched ruffles. The satin dress has small straps. The ruffles flow lower on one side giving the dress a glamorous look. Your bridesmaids will shine in satin as they gather around you for photos. The ruched ruffles on this red bridesmaid dress makes it a perfect pick for any wedding, and makes it number one on our list.